New Delhi: The greater short-toed lark winters mostly in Africa and India. Large flocks of them make the long migration from Europe and Central Asia and arrive in India just as the rice fields are harvested in October. The birds feed on the leftover grain—hungry after their transcontinental flight. Of these, “at least 23 species are of conservation importance, as per the Birdlife International report," says Gopi Sundar of the International Crane Foundation (ICF). Rice seems to be the crop that supports the greatest diversity of birds in the subcontinent, based on data from ongoing scientific studies, even when the fields are not being cultivated. Larks and pipits use the fallow fields for breeding and foraging, while herons, storks, stilts and sandpipers use them when they are flooded. 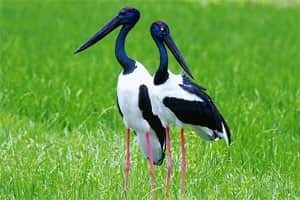 The world’s largest known breeding population of two large endangered water birds, the sarus crane and the black-necked stork, are found in the rice fields of the Gangetic floodplains in North India. While rice farming dates back 10,000 years, the last hundred years has seen more areas being brought under the crop, resulting in habitat loss for many hundreds of bird species. India today has the highest cropland cover per unit area in Asia. Rice is the second most important crop after wheat in terms of geographic coverage, with over 59 million hectares covering nearly 13% of the total land area, whereas the so-called protected areas—wildlife sanctuaries and national parks—form less than 5% of the geographical area in the Indian subcontinent. Traditional cultivation methods, however, have always been conducive for wildlife conservation because this involves farmers retaining habitat patches such as wetlands, grasslands and shrub cover within the farm landscape. But cultivation practices in India are undergoing rapid change as the demand for food rises and rainfall pattern changes affect agriculture. Today, farmers use every inch of land for maximum production, affecting birds that use wetlands, shrub and grassland as their habitat. On the other hand, the research thrust is on developing rice varieties that need less water or on growing replacement crops with a higher food production capability in dry conditions. This cuts down the need for flooding and drives away wetland birds. For instance, the ministry of agriculture has developed 41 varieties of rice and 22 varieties of wheat that require less water. The focus on agricultural production ignores environmental, economic, and biodiversity concerns. The trend is compounded by the extensive use of chemical and mechanical technology that adds to the odds against the birds. Apart from this, the system of rice intensification (SRI), which is practiced in many areas, advocates planting the cereal at lower densities, thereby reducing the cover for birds that breed and forage in fields. A pair of black-necked storks. And while waterlogged fields can resemble wetlands, the disappearance of the real thing under the onslaught of rice is tilting the ecological balance. “Birds like the ferruginous duck, sarus crane, nordmann’s greenshank, oriental darter, spot-billed pelican, painted stork, lesser adjutant and greater adjutant are thought to be declining due to the loss of wetlands to rice cultivation," says ICF’s Sundar. 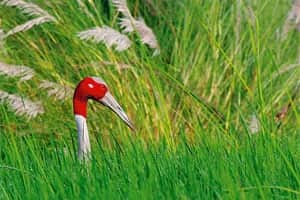 The decline in wetlands because of farmland and urban areas expanding has cut down the habitat of sarus crane pairs by 9.7%, said S. Subramanya, an expert on agricultural ornithology. The “expansion of towns permanently displace 0.7% pairs annually. 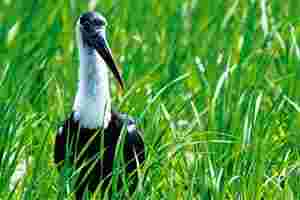 In the case of black-necked storks, the annual agricultural expansion has caused reduced quality of territories of 6.7% of breeding pairs." In 1981, India joined the Ramsar Convention, named after a place in Iran where the first world convention on wetlands was held in 1971. The convention recognizes rice fields as human-made wetlands but also expresses concern that inappropriate conversion of wetland to rice fields may have a potential negative impact on local biodiversity and the related ecosystem. 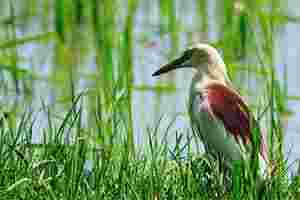 Another major concern is the documentation of chemical accumulation in the tissue and eggs of water birds and raptors that use rice fields, with evidence that birds ingest these chemicals through their prey. Many migratory species that winter here and breed in northern Asia have shown egg-shell thinning, with pesticide being the key suspect. Accumulated organo-chlorines in Indian birds were found to be the highest in the world. Chemicals recently banned for agricultural purposes, such as dichloro-diphenyl trichloroethane (DDT) and benzene hexachloride, were found to accumulate more in raptors, especially white-rumped vultures and black kites, and water birds such as western cattle egrets. The lethal effect of freshly sprayed pesticide on fields and ripening grain on sarus cranes and other species, including the Eurasian collared dove and the common pigeon are alarming. In north-central, western and south India, rice seeds are soaked in pesticides before planting to avoid damage by termites. This is lethal for birds that feed on the freshly planted seeds, particularly the sarus crane and Indian peafowl. Demand for food is increasing with a ballooning human population, hence the conversion of farm land back to wildlife habitat is not practical. Can rice fields that are traditionally farmed become a useful conservation tool? They seem to offer an alternative to the standard conservation practice of declaring areas protected, incorporating people’s interests while providing conservation benefits.